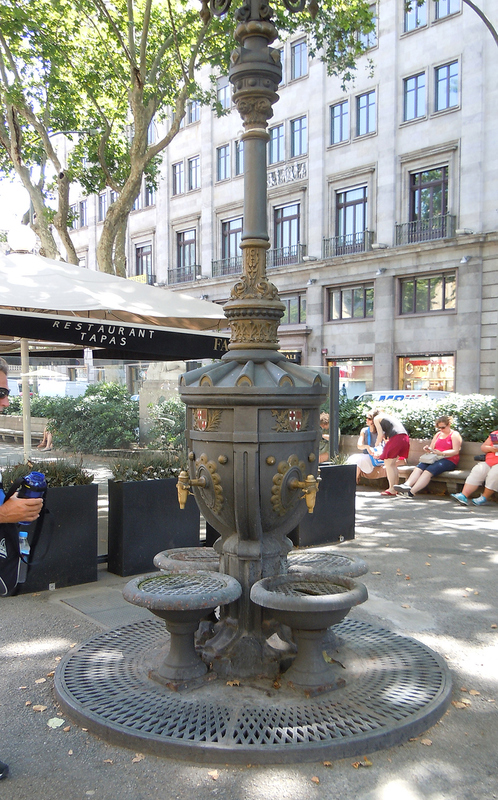 Barcelona,Spain, June 2014 - For me, there's no more beautiful, educational and exciting place in the world to visit than Western Europe. 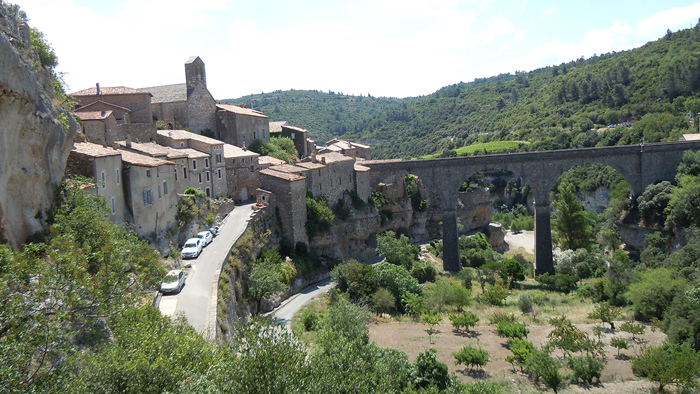 And to visit parts of it on a world class motorcycle on perfect riding roads without traffic, unencumbered by baggage, with experienced tour guides who know all the best roads and places to stop, is nothing short of nirvana. 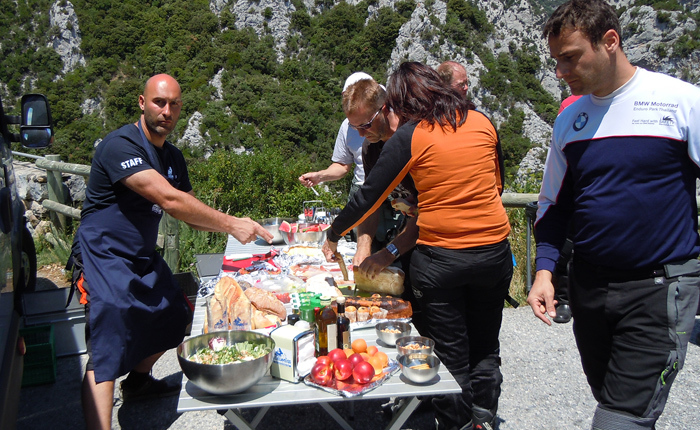 This is the definition of an Edelweiss Bike Travel tour. And while they have a tour catalog chock full of motorcycle tours taking place around the world from the far reaches of Africa and Asia, to Australia and America, every one of their European tours is on my bucket list. 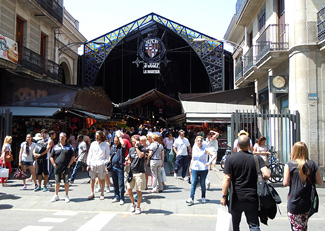 Especially when they partner their rides up with motorcycle manufacturer like Ducati and Triumph, with a Start and End point at the company's factory for a visit or at a World Superbike or MotoGP round. 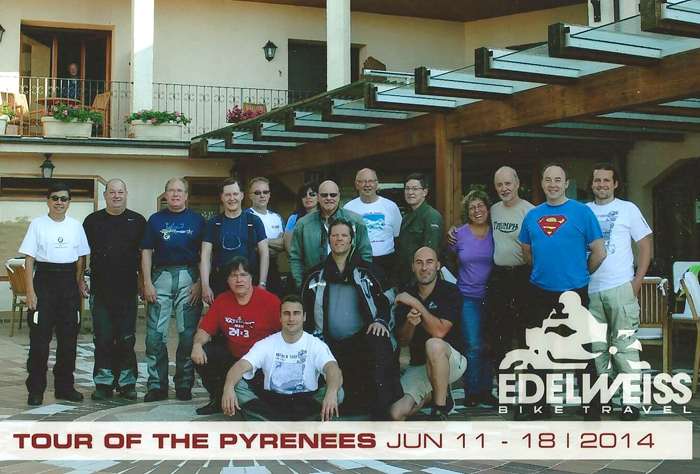 The standard Edelweiss Tour of the Pyreness offers six days of challenging riding at a fairly fast pace, with great scenic and historic stops and hotles along the way. 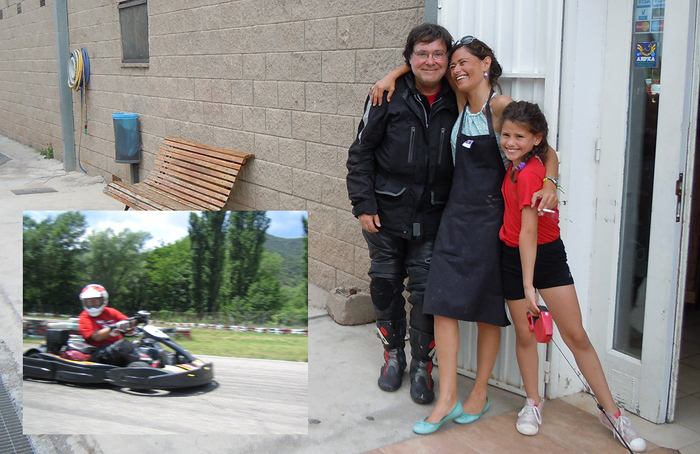 At Coll de Boixils we even had a afternoon for go-cart racing! 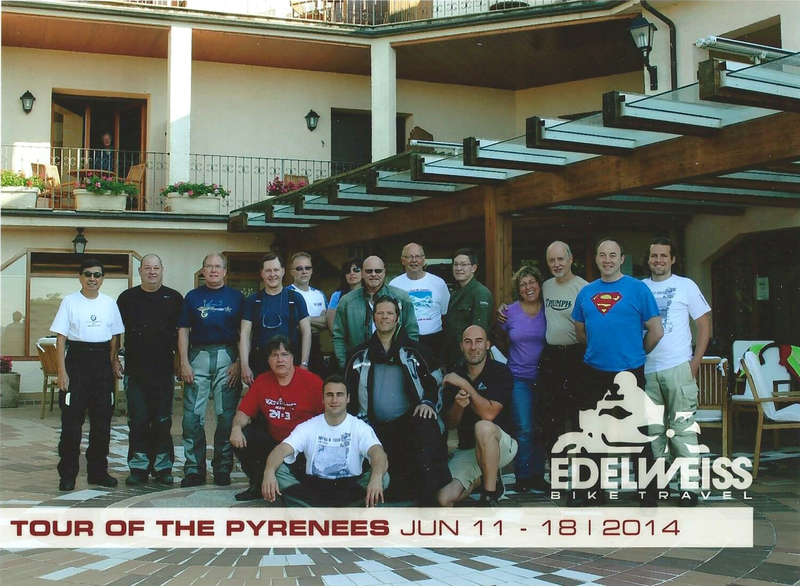 Edelweiss also offers a Pyreness Extreme Tour which is one day longer and offers more mountain riding just in Spain. 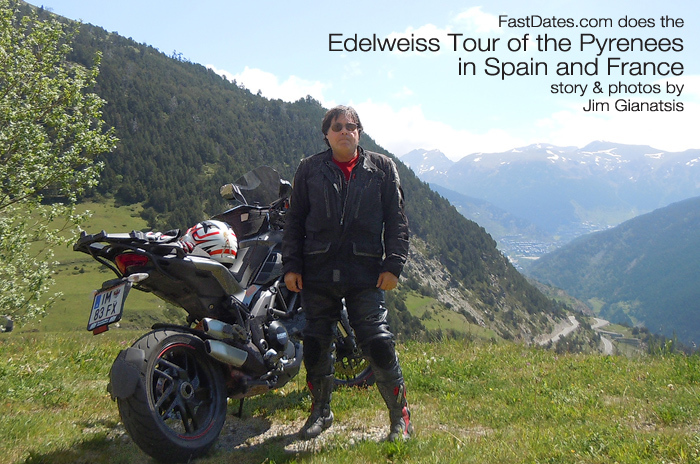 But be fore warned, Edelweiss Tours are highly addictive, and you'll probably find 80% of the riders on your particular tour to be return addicts. Myself included. 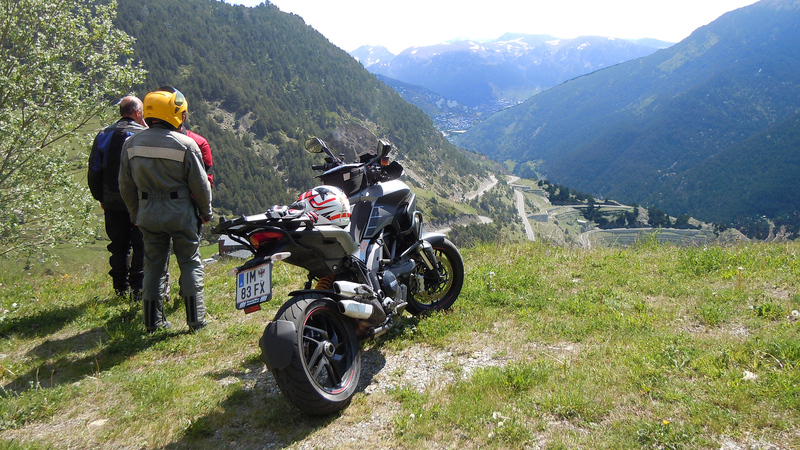 For me the Edelweiss Tour of the Pyrenees was my fourth Edelweiss adventure, with three previous tours having included the High Alpine Adventure (Germany, Austria, Switzerland, Slovakia and Italy), Southern France (The Western Alps with Monte carlo and the French Riviera), and the Ducati Tour of Tuscany Italy which included a factory visit and the Imola World Superbike round. 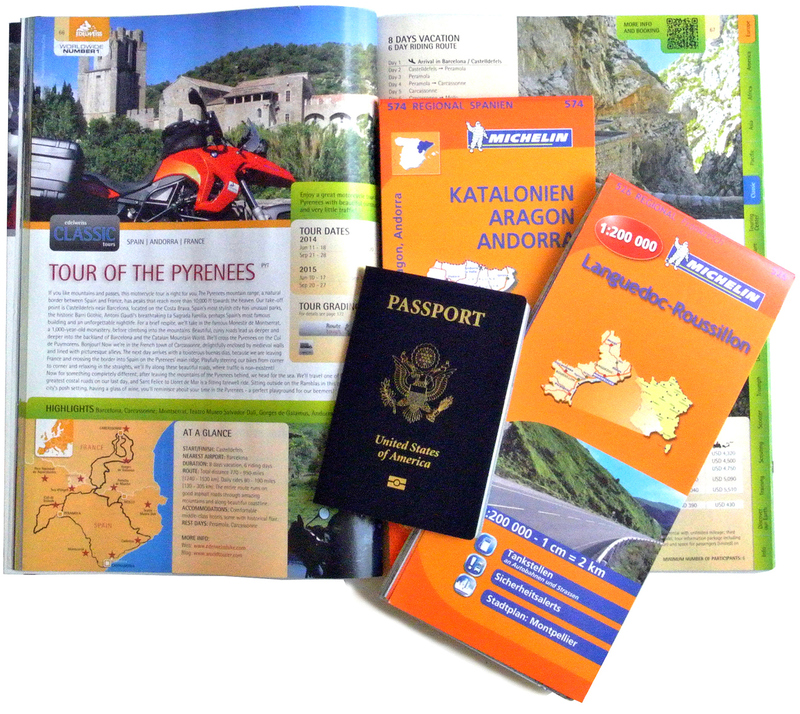 I try to take one motorcycle theme adventure to Europe at least every two years. And if not with Edelweiss, than a Ducati Riding Experience (DRE) at a GP track in Italy, or a visit to World Ducati Week as my budget allows. 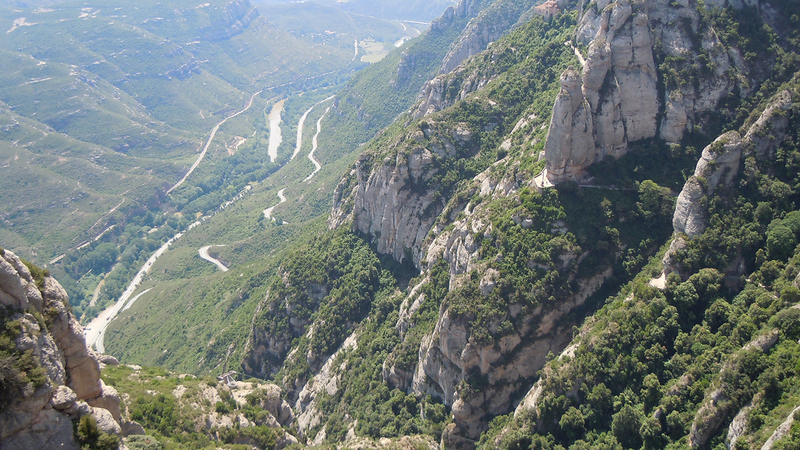 You'll notice a pattern, that I like challenging, twisty mountain roads. 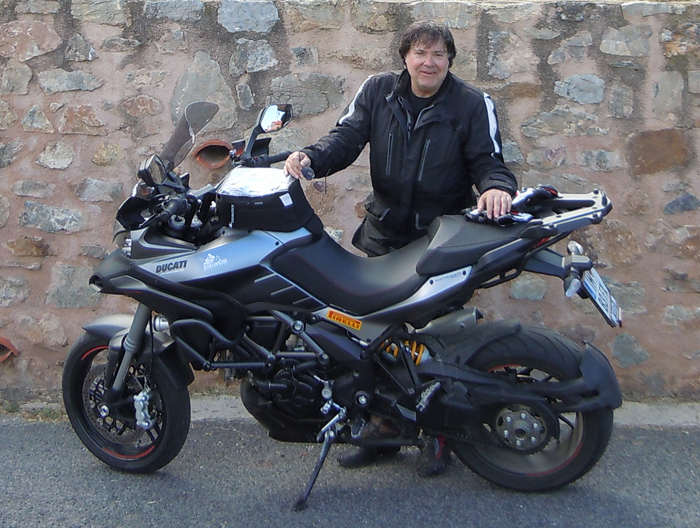 And my motorcycle of choice is normally the Ducati Multistrada 1200 which offers the best power-to-weight, comfort and handling prow ness of the wide-ranging stable of available Edelweiss bikes. 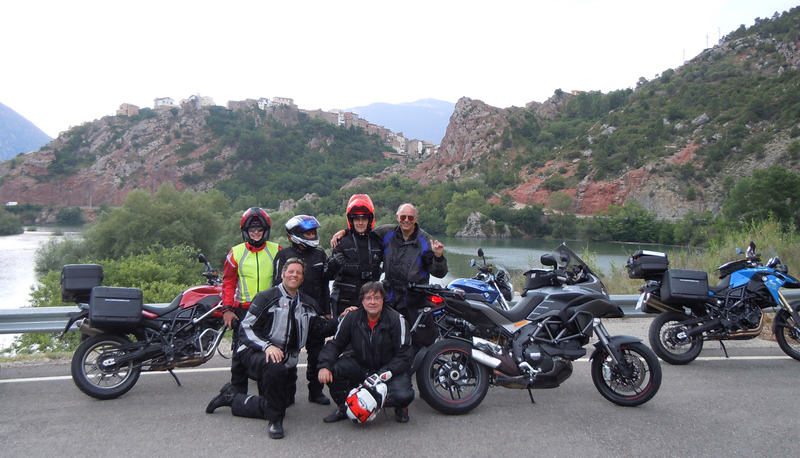 This trip I was the only Ducati mounted rider in our 15 rider group, plus our 3 Edelweiss Tour Guides Alejandro, Peter and Miro. 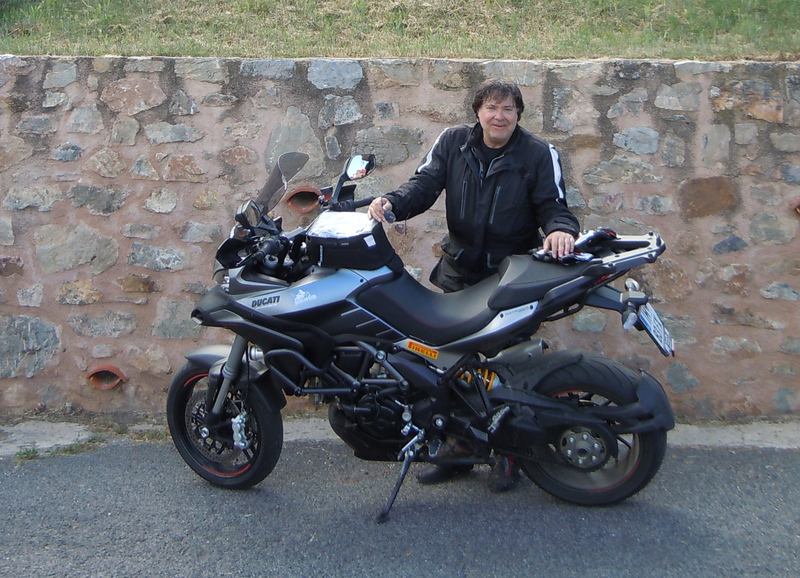 Most opted for the big BMW R 1200 GS and the more nimble Triumph Tiger 800s, while out tour leader choose a BMW F 800 GS. All the tour bikes come equipped with hard baggage and a tank bag, but I make it a point of taking it off the luggage and leaving it behind at the starting base.Less bulky stuff to bang up in a spill, and it makes the bike handle better, and easier to get on and off. If you think you'll need additional rain gear, you can get it out of your luggage that morning. But for the most part your riding gear should be waterproof anyway. 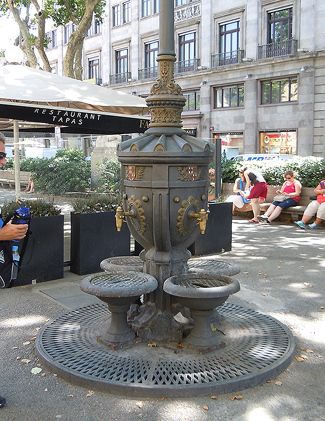 And the ride stops every 2 hours for drink ad rest breaks, so you rally don't need to carry any extra supplies. For this year's Edelweiss Tour in Europe i wanted to go to some place new, and their Tour of the Pyrenees checked all the right boxes for challenging mountain roads, historical sites, a ride along the Mediterranean coastline, and a visit to the country of Spain where I'd never been. 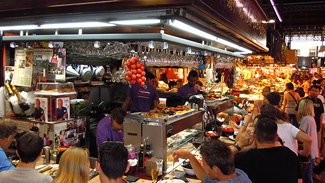 The icing on the cake was the Tour's start and ending location next to the city of Barcelona, Spain, one of the legendary cities of Europe. 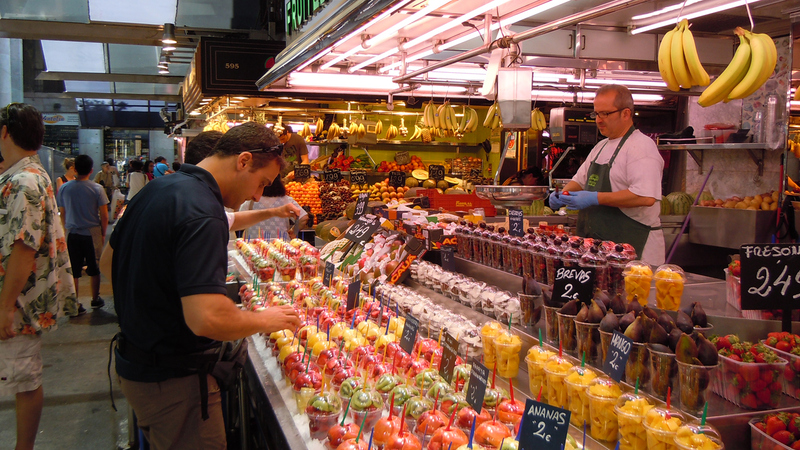 To make sure I experienced the best parts of Barcelona I signed up for the Barcelona Guided City Tour with our English speaking Spanish Edelweiss Tour guide Alejandro, which added an extra day to walk Barcelona on the 7-day bike riding tour. 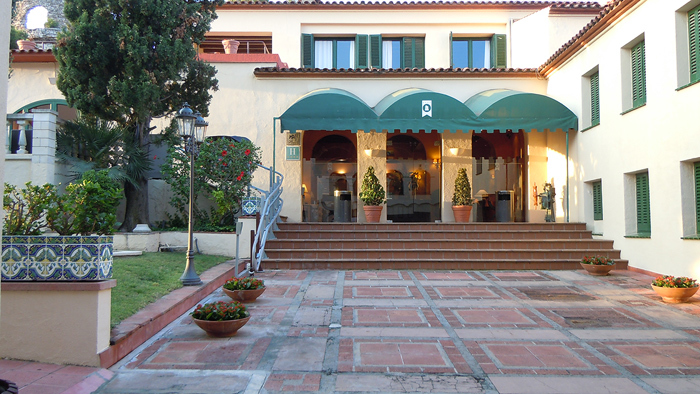 The added cost was around $400 which included lunch and dinner and an extra night at our Edelweiss base Grand Hotel Rey Don Ja in nearby Castelldefels by the Barcelona airport. 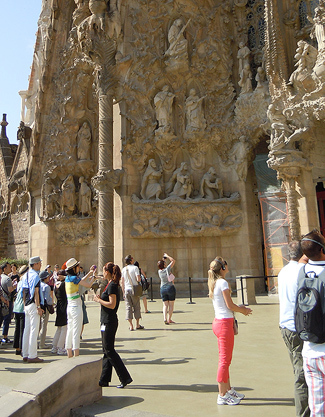 Highlight of our walking tour of Barcelona was, of course, the spectacular La Sagrada Familia Catholic cathedral designed by Antoni Gaudi. 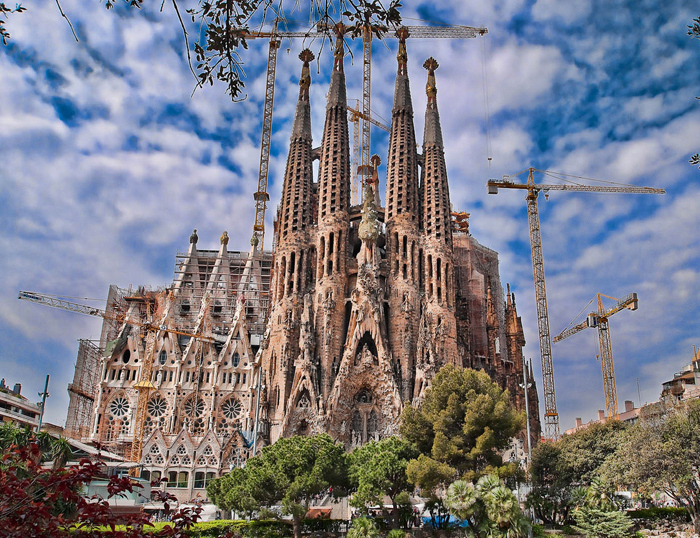 Construction began in 1882 from private donations, with a stop during the Spanish Civil War and World War Two, then resumed in the 1950s with an anticipated completion date of 2026, the 100 year centenary of Gaudí's death. 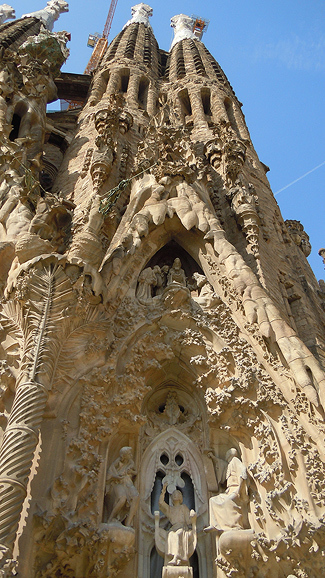 The exterior faces of La Sagrada Familia features extensive hand carved religious themes and detail. 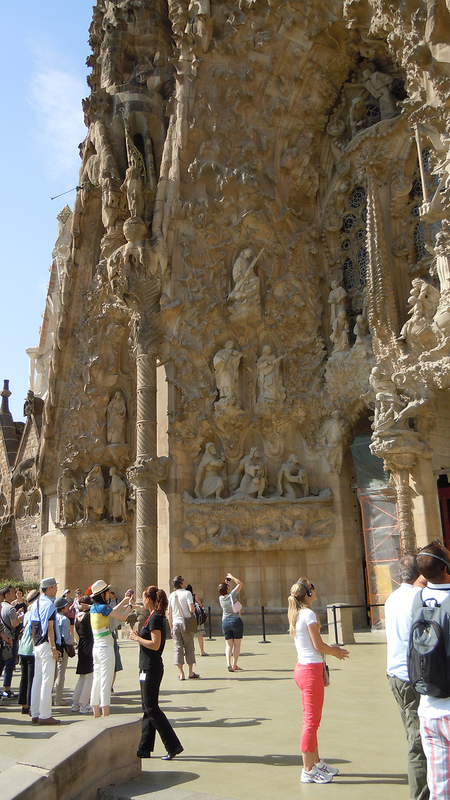 Inside, the stone architecture is much more modern with carved stone columns designed to look like trees rising some 200 feet. 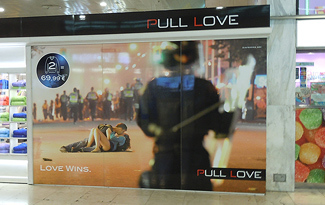 Make love, not war. 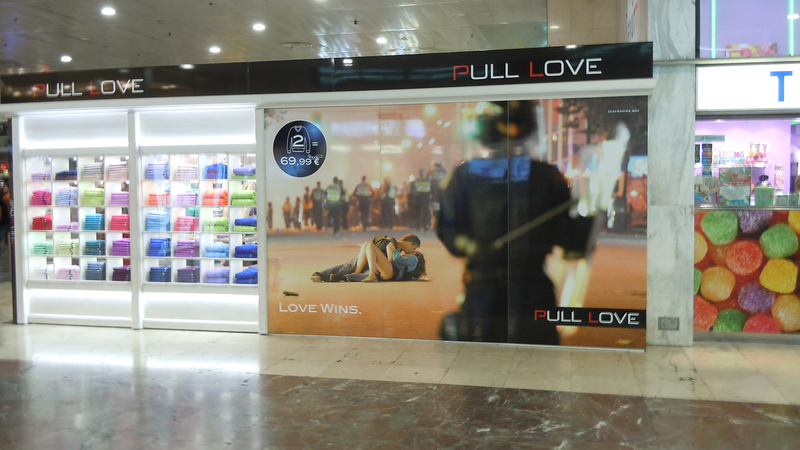 The Pull Love clothing shop in the Barcelona train station. 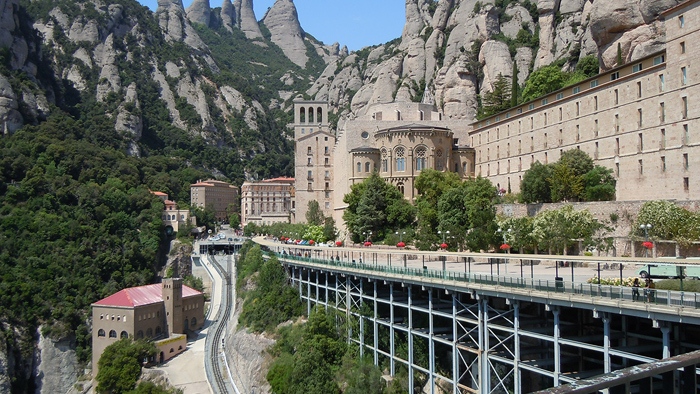 We got to ride the train from our hotel in Castelldefels to Barcelona and back for the city tour. 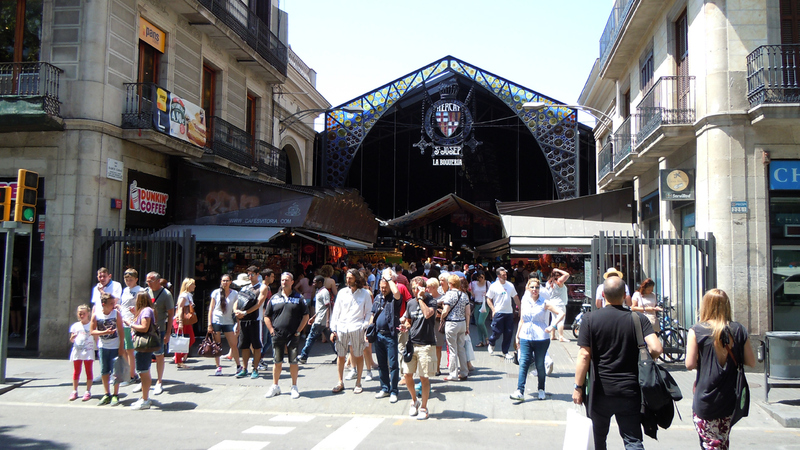 Our walking tour of Barcelona included a visit to the famous city Market for lunch, a walk down the main city plaza, and a vist to an apartment building designed by Gaudi. 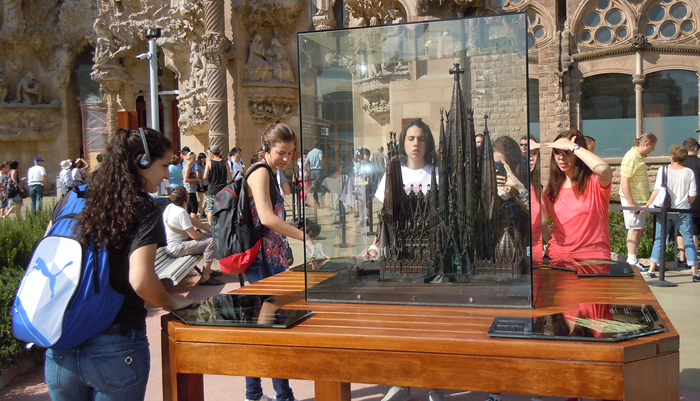 This scale model outsidethe La Sagrada Familia cathedral helps provide a better understanding of its complex design. 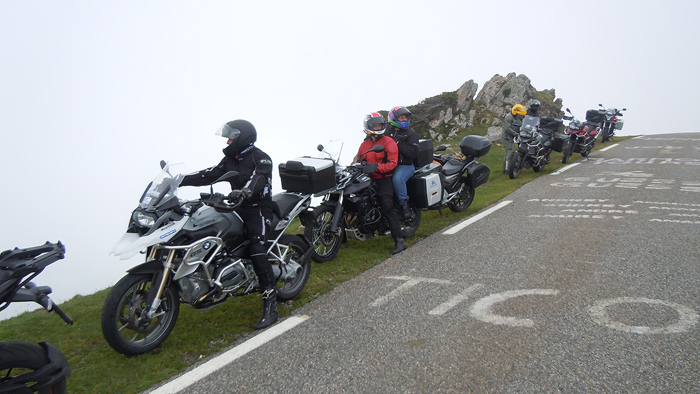 The nice thing about any Edelweiss tour is you can ride at your own pace, or even leave the group to sight see if you want. The tour guides will always wait or come back to find you, or you can meet up at the hotel that evening. 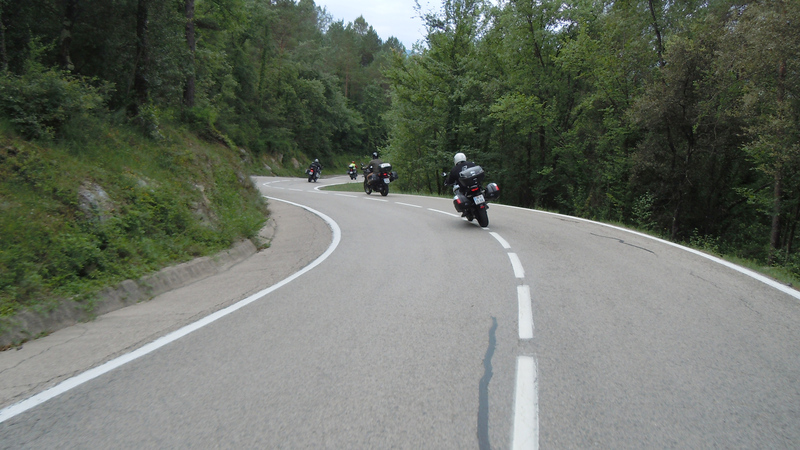 And at the start of each morning's ride you can copy the days riding route on your supplied Michelin Road map. 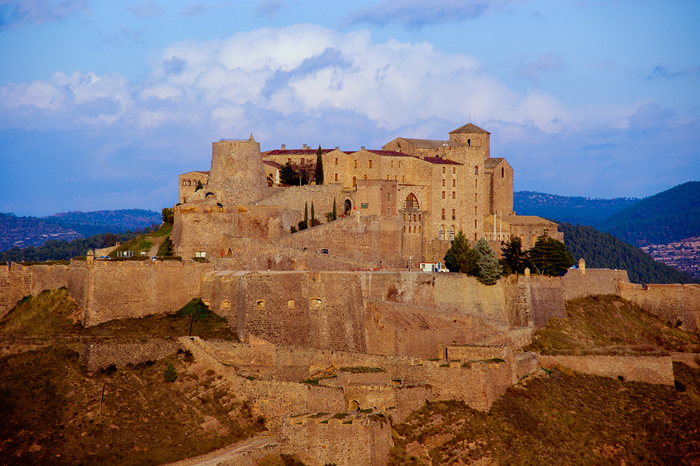 One of th many castle fortress cities in Spain and France we can apon. Some we went into and visited and had lunch, but many we just didn't have the timeto go into and visit in our 7 days of riding. Our tour will started in Castelldefels, located just north of Barcelona. The capital of Catalonia, Barcelona, is well worth a trip by its own, offering unusual parks, the historic Barri Gòthic, Antoni Gaudí’s breathtaking La Sagrada Familia as well as the “Ramblas”. 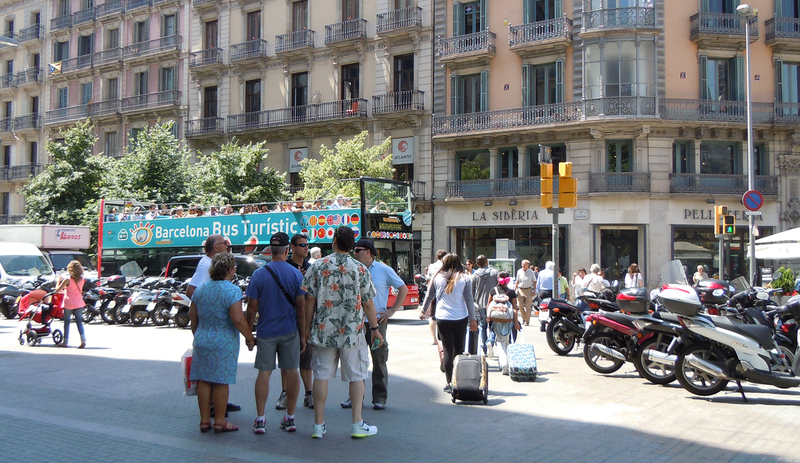 You can discover all of this by arriving one day prior to tour start and by participating in the Edelweiss guided city tour. Our hotel for both the start and the end of the tour was was the Playafels Hotel, built on a mountain top in the ruins of an old castle, with a breath taking view of the Mediterranean Ocean from our dining room balcony. Part of an old castle ruin was in the back of our Playafels Hotel next to the swimming pool and bar, overlooking the Mediterranean Ocean. Crossing one of Europe’s mini states, Andorra, and passing the Col de Puymorens, we arrive in France, bonjour! 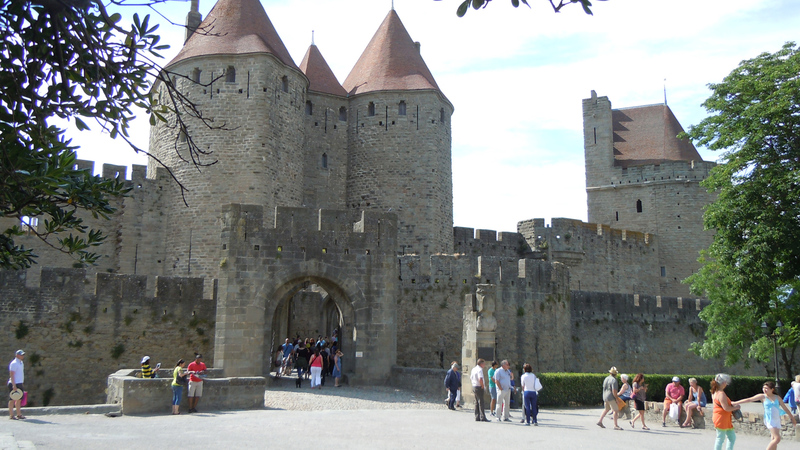 We can spend a rest day in the stunning French town of Carcassonne, delightfully enclosed by medieval walls and lined with picturesque alleys. 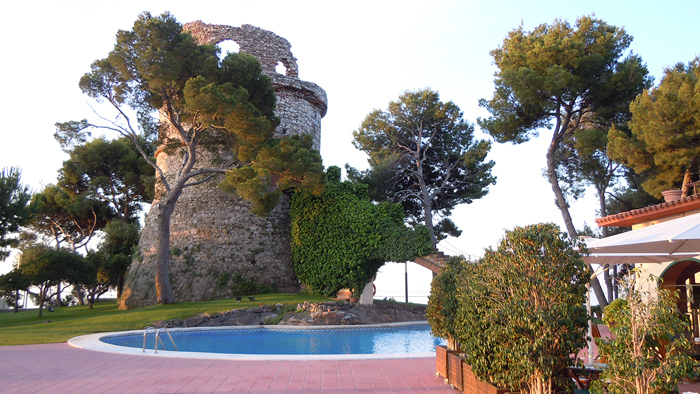 Above, We stopped inside historic Castle Cardonas for lunch which was a full beef stake with cheese on toasted sandwich bread. 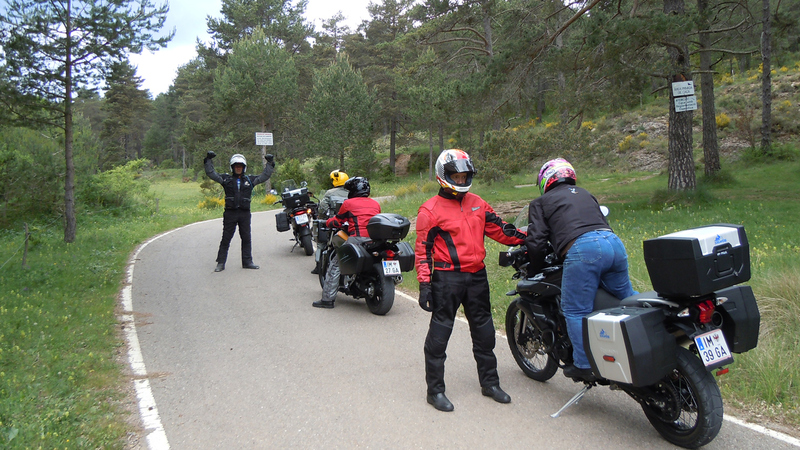 Below, our veteran Spanish tour guide gives us a wave, with tour mate married couple Udo and Susanne from Germany. Our two other Edelweiss tour guides on the trip included Miro and Peter. Normaly one tour guide takes the lead or fast riding group, and the 2nd tour guide rides clean-up at the rear, or takes the slower / toursit group on an easier or more scenic route. The 3rd tour guide will drive the Edelweiss support van withour luggage to the next hotel and have our luggage waiting for us in our rooms when we arrive, already checked-in. We just go to our rooms and peel off our ridding gear, a quick shower and change, then meet inthe bar for a few beers before dinner! The next day arrives with a boisterous buenas dias, because we are leaving France and crossing the border into Spain on the Pyrenees’ main ridge. Playfully steering our bikes from corner to corner and relaxing in the straights, we’ll fly along these beautiful roads, where traffic is non existent! Making new friends everywhere we went! The 2-day stop over in Peramola gave us the change do a short day motorcycle ride in the nearby mountains, then we spent a few hours at a local go-cart track where the owner and her daughter shared with us their family lunch of fresh cooked seafood, and kindly invited us back for lunch and cart racing as often as we wanted. Picture stop! 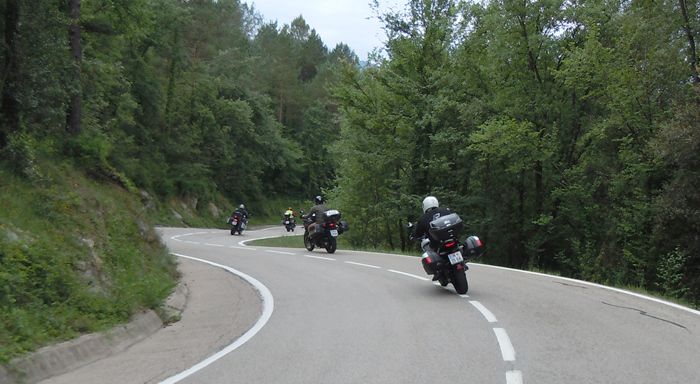 The nice thing about any Edelweiss tour is you can ride at your own pace, or even leave the group to sight see if you want. The tour guides will always wait or come back to find you, or you can meet up at the hotel that evening. 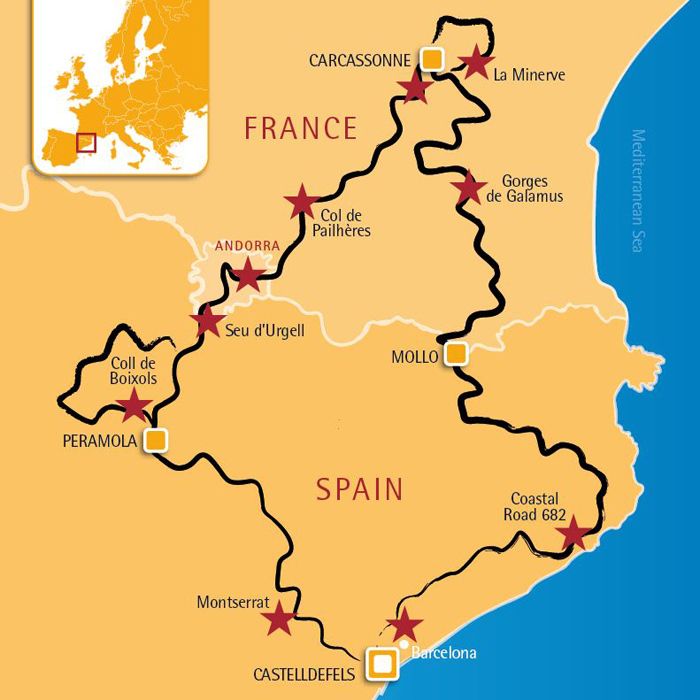 And at the start of each morning's ride you can copy the days riding route on your supplied Michelin Road map. Here, posing for pictures with my new Edelweiss tour buddy Udo from Germany who ride a 1200 GS Triumph 800s with his wife Susanne on a Triumph 800. 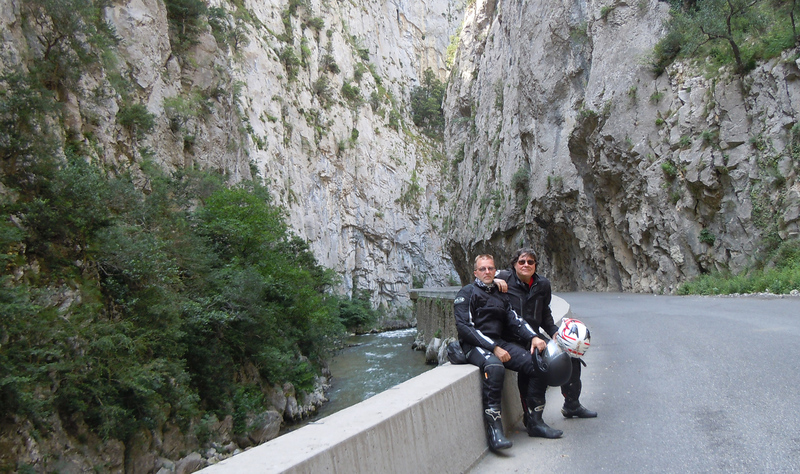 Udo and I, and veteran tour guide Alejandro got into some spirited canyon carving at times that would leave the rest of the group behind until the next catch-up point. 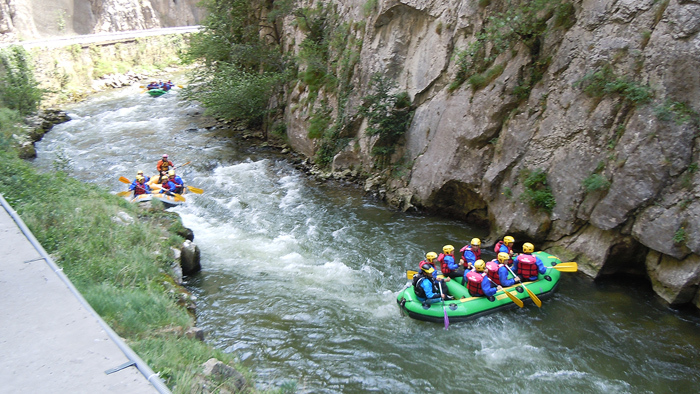 Below, rafters on the river. 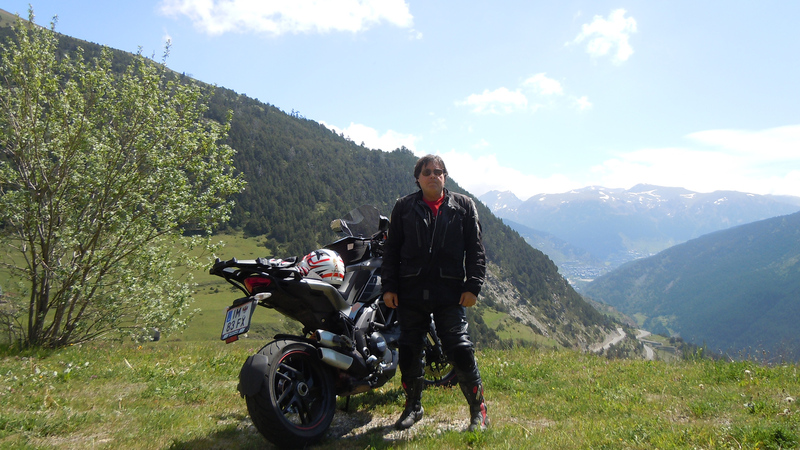 One of the spectactular mountain passes with snaking roads to the top and bottom that we crossed over near the independant mountain country of Andorra inside the Spanish Pyrenees. 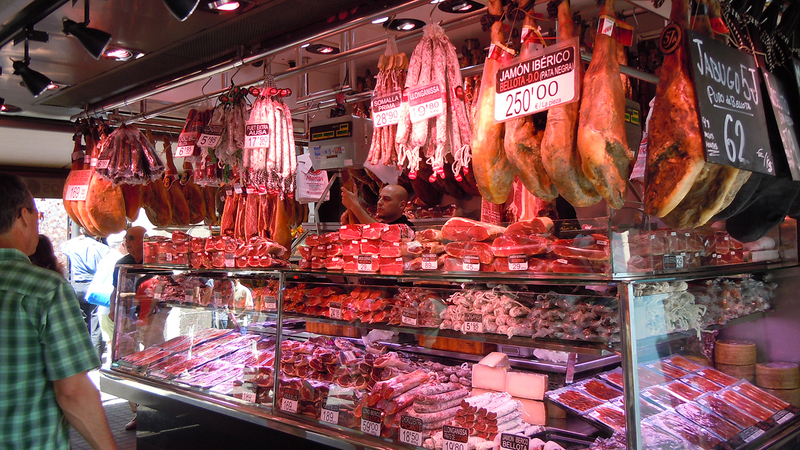 Until I took this Edelweiss tour I never knew Andorra exhisted! Waiting for the cloulds / fog to clear so we could see the view from atop a mountain. 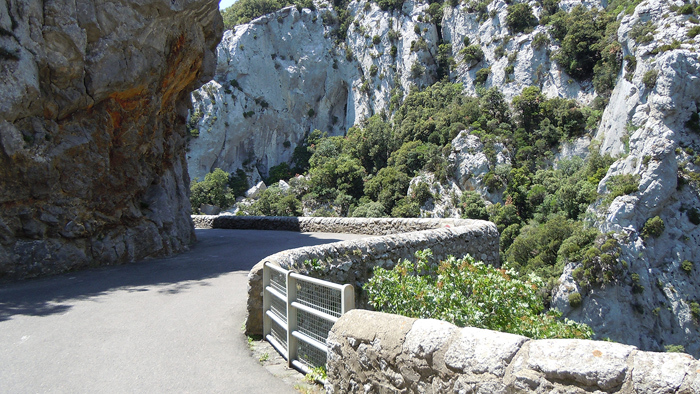 The paint markings on the road are from major bicyling events like the Tour de France. 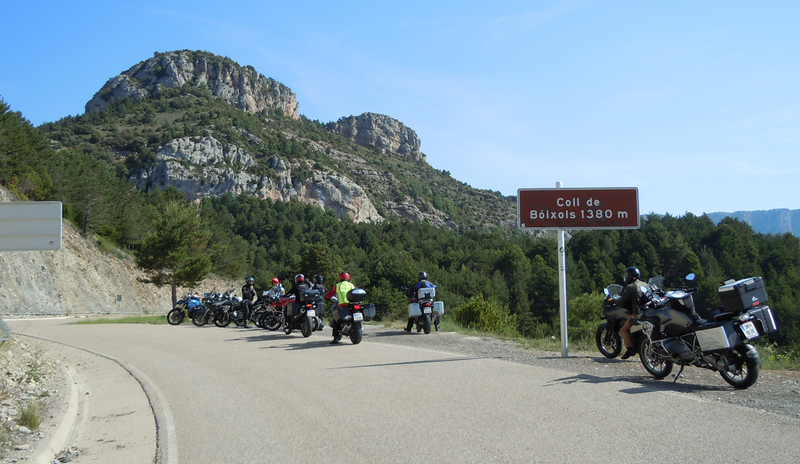 Every Edelweiss tour offers incredible roads, great bikes, and the opportunity to make many new freinds from around the world! 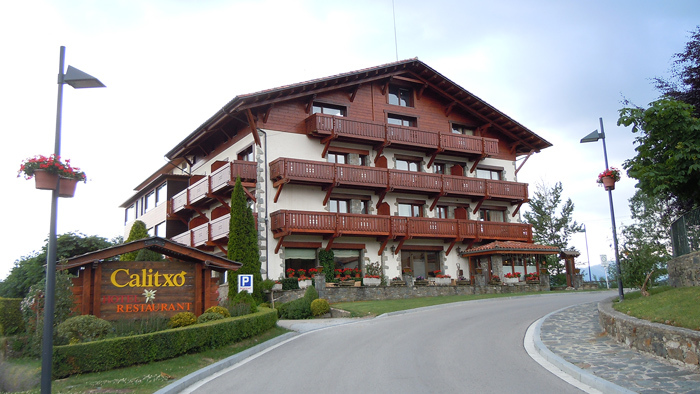 This was our beautiful luxurious resort hotel Can Boix in Peramola, Spain, where we spent 3 nights while riding in the area, north to France and then in return. 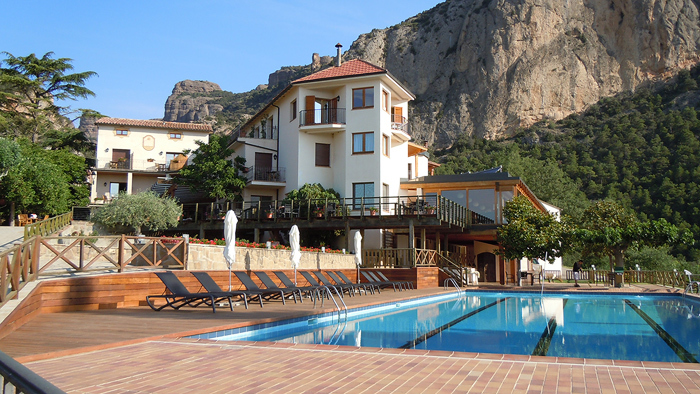 If you wanted to stay here one day and relax, rather than ride, you could. 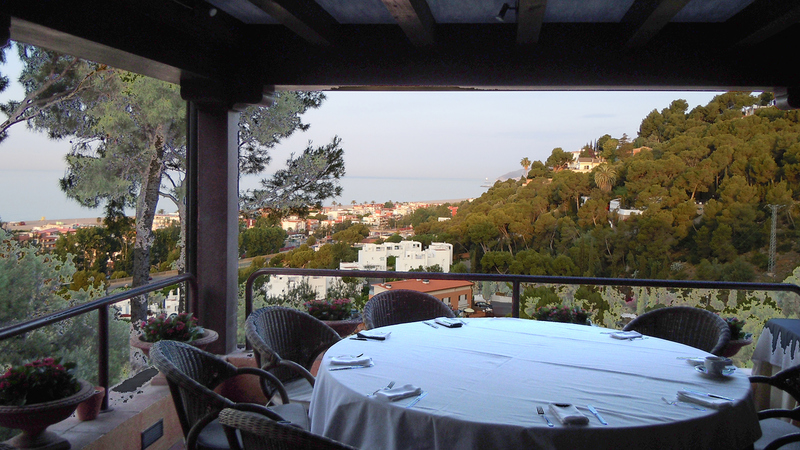 That's the glassed-in restaurant overlooking the swimming pool and the valley. This is the little fortress town of Minerve in Southern France which was home to the Christain Catars in 1210, when the good Catholic Pope sent in Crusaders in to lay siege to the town, catapult boulders at it, poison their water and starve them, forcing them to surrender. At which point the town's 120 Catars were burned to death live in the town square for being heretics to the Catholic faith. Nothing has changed some 800 years later when it comes to the stupidity and the cruelty of religions. Just look at the Middle East and Africa today. And America's righteous need to use our military force them how to live in their own countries. 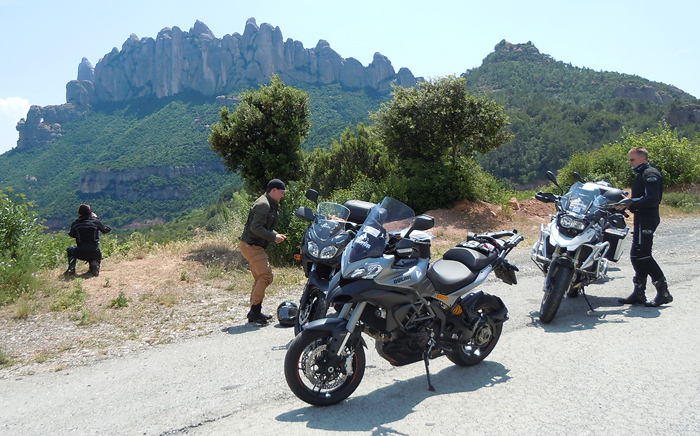 Above, my favorite Edelweiss tour bike is the Ducati Multistrada 1200ST. While not quite as comfortable as the heavier, less powerful BMW 1200 GS that are also available, the Ducati is the class leader in hard cayon charging. 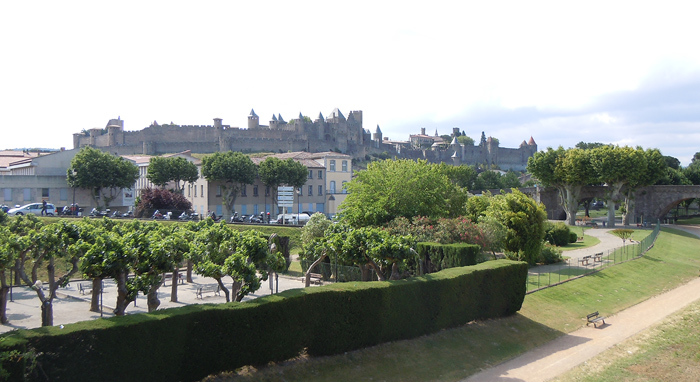 We spent two nights in France, this time in Carcassone where we visited the Medieval walled city. Our hotel was the Chateau de Cavanac which seemed almost as old, with tiny 6-inch round holes in the hotel room's wall for window light and fresh air. 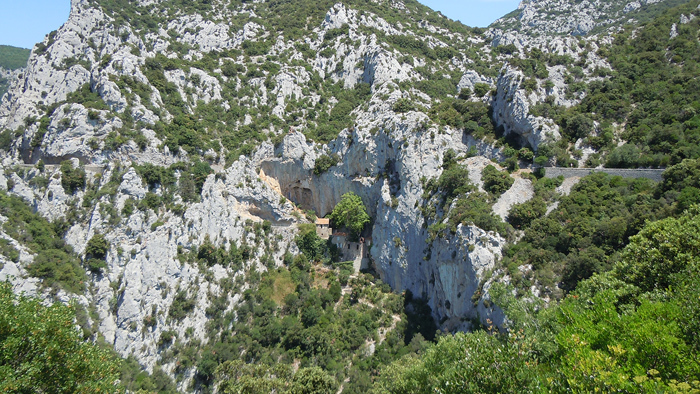 Above: The Gorges des Galamous in the mountains of France really scared me to death. The twisty road is carved into sheer cliff walls that drop 1,000 feet into the river gorge below, with the short 3-foot stone wall offering no safety barrier if you hit it on a bike and flip over it. Here, you can just make out the road we traveled on the mountain sides with 1000 foot drops across the Gorges des Galamous. Check out the little cottage built into the cliff face with just a long twisty foot patch for access. 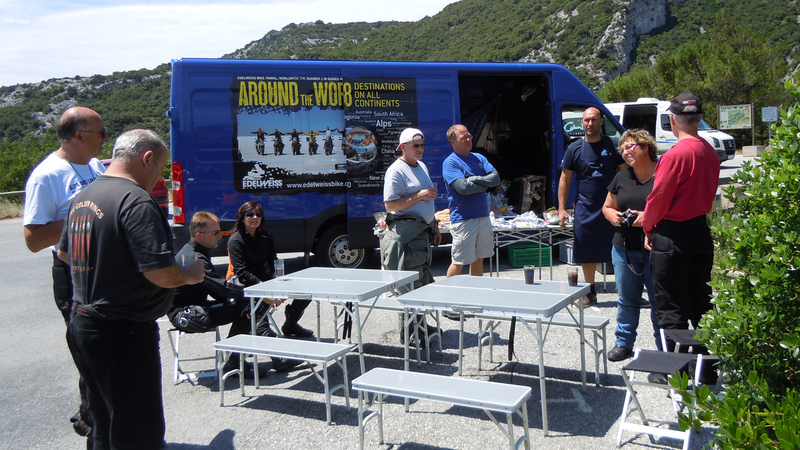 On one day of most Edelweiss tours like ours, we'll come upon our Edelweiss chase van, like here, where guide Marco has prepared us an excellent lunch, complete with tables and chairs, plates and silverware. Each day the van also picks up and takes our personal luggage from one hotel to the next, and the guide has it placed in our room in time for our arrival for a great day of riding! 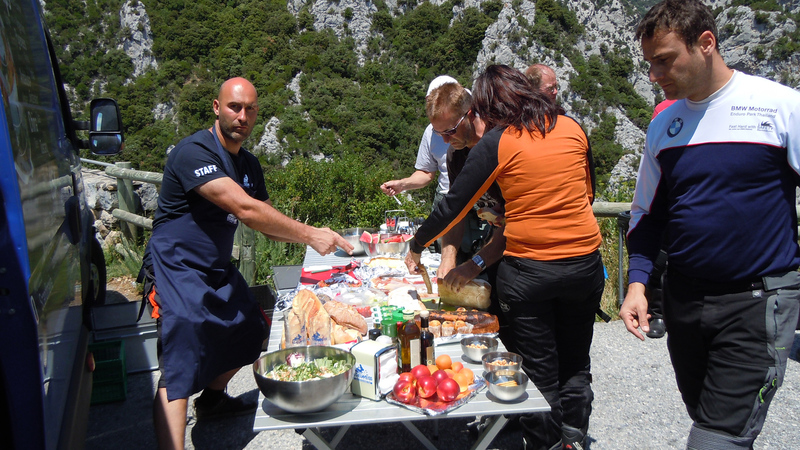 Here, tour guide Miro had a picnic lunch waiting for us as we rode in on the spectactular cliff roads of the Gorges des Galamous. 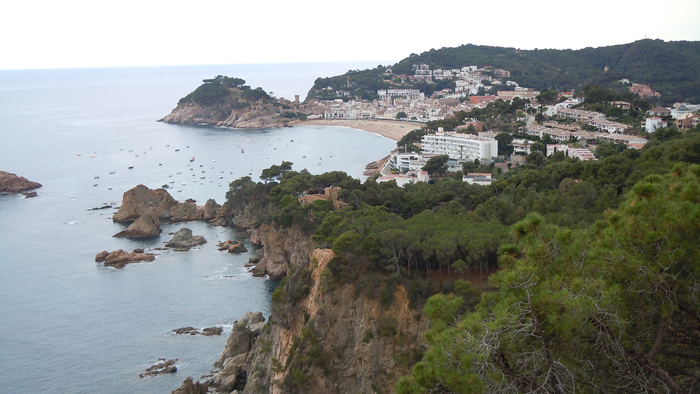 Now for something completely different; after leaving the mountains of the Pyrenees behind, we head for the sea. 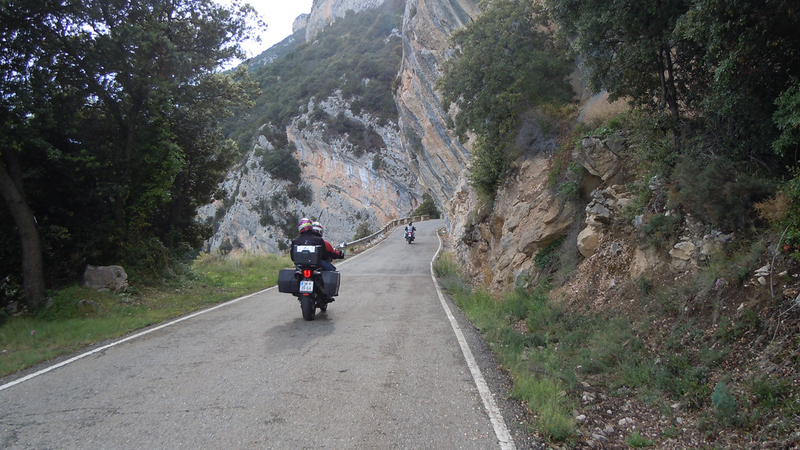 The last day of the Pyrenees tour took us down the Spanish coast towards Barcelona on a road reminiscent of California's Pacific Coast Highway One. We’ll travel one of Europe’s greatest coastal roads on our last day, and Sant Feliu to Lloret de Mar is a fitting farewell ride. 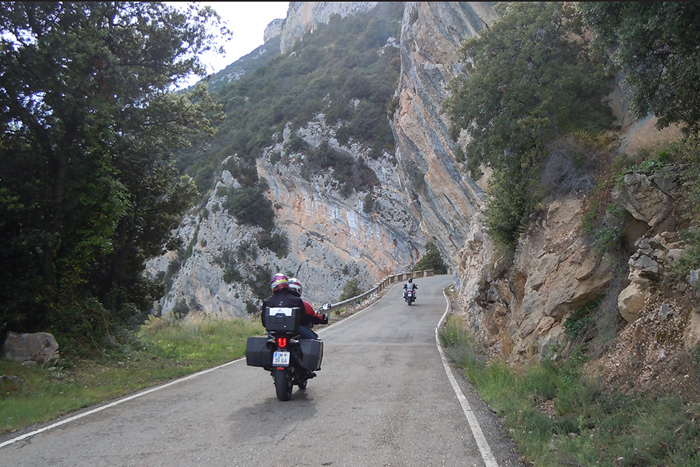 Back in Castelldefels and sitting outside at the pool with a glass of red wine, you’ll reminisce about your time in the Pyrenees, about a week of perfect riding! Don't wait! 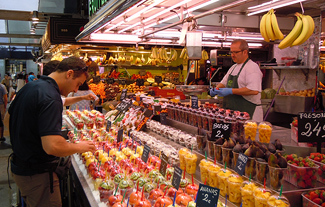 Make up your own "Once in a Lifetime Trip" Experience on an Edelweiss World Tour of you choice now. 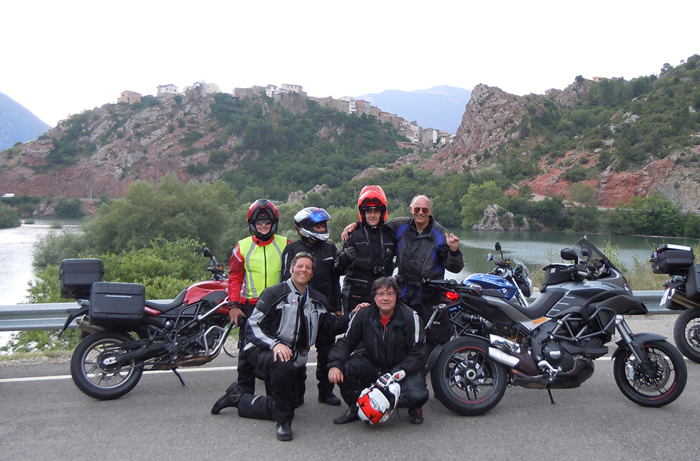 Troy Bayliss Academy at Misano Italy and a Visit to Paris! Troy Bayliss Academy Track School at Imola Italy and a Visit to the Ducati Factory!